Polymarble - Bathroom Vanities Bathroom counter tops have many different roles for your vanity including Polymarble counter tops. Not only must they be aesthetically pleasing, they need to be durable and capable enough to withstand the potentially damaging effects from water, soap and cosmetics. Our catalog offers a wide range of different counter top material including granite, marble, glass, stone, ceramic and poly marble. There are many perks to ordering online from Luxury Living Direct, including Free Shipping on all orders! 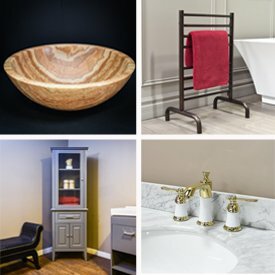 Call our customer service at(800) 574-3022 if you are ordering 2 or more vanities and see if you can get a special discount!